A superbly appointed sea view villa for six set on the coastal hills of Choeng Mon, this holiday spot is ideal for a small party of friends or as a romantic getaway. It is close to one of the best beaches and tourist destinations on Koh Samui and features its own infinity edge pool and has fabulous countryside and sea views. 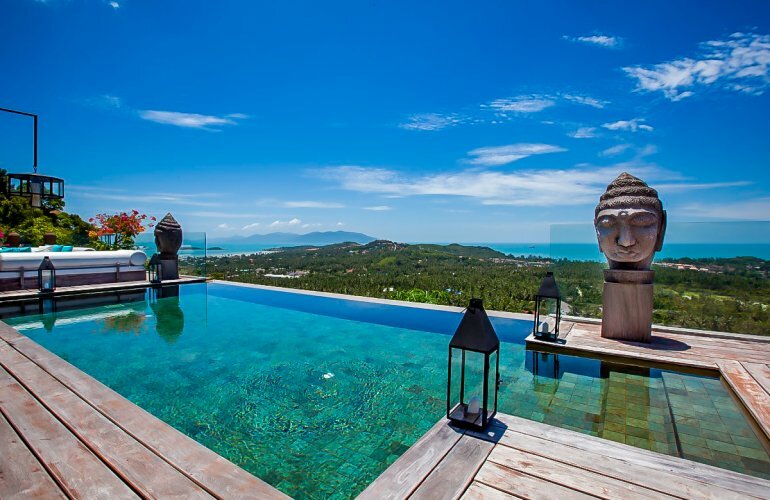 The villa is set on the hillside between Choeng Mon and Chaweng beaches on the north east coast of Koh Samui. It is a 10 minute drive from the airport and also to the bustling centre of Chaweng, and just 5 minutes from Choeng Mon beach. The Santiburi Golf and Country Club is half an hour's drive, and the interesting Fisherman's Village at Bophut is a 15 minute drive. Despite its proximity to all those interesting places that a group of friends might need to make their holiday special, such as good restaurants, shops, interesting bars and nightspots, this little gem of a holiday destination is a very private and secluded hideaway, just perfect for some daytime sun, sea, pool swimming or total relaxation, perked up with trips out of an evening to sample the local cuisine or entertainment facilities. The furnishings and decor are cool, natural tones and materials, chosen with care and style, and combine the best of both Asian and Western features. Thai statuary, artefacts and wall art abound, together with sumptuously comfortable living room sofas and chairs, plus the three fully air conditioned double bedroom suites with cable TV, DVD and surround-sound systems, place this villa at the top of the luxury list. There is Wi-Fi Internet access throughout the villa for guests' use, both indoor and outdoor sound systems, and expansive pool and outdoor sitting and dining terraces. The living area is reached from the lower entrance level via an open tread stairway. This expansive open plan space includes a dining and sitting room to the front overlooking the pool, and at the side and back a beautiful modern Western-style kitchen with a feature island unit / breakfast bar, above which are hung three huge bell-shaped Thai lamps. In the dining space there is a large wood table where six guests can enjoy more formal dining beneath a very tropical ceiling fan, while enjoying the stunning views through the floor to ceiling glass doors. Adjacent to the dining room is the seating area, which has similar breathtaking countryside and sea views through the slide-away glass walls. The three double bedroom suites are beautifully furnished and are fully air conditioned for night-time comfort. They all have en suite shower rooms. The first of the bedroom suites is close to the kitchen and has large glass doors opening directly onto the pool terrace. Just around the corner in a shady and secluded spot on the terrace, there is a sofa and a Jacuzzi for some quiet relaxing moments. The master bedroom has a seating area, and in the en suite there is a sunken bath and twin hand basins. The other two bedrooms are on the villa's lower level, and are next to a small intimate sitting room. Both these bedrooms have desks, and their own super en suites. The exterior decking is extensive and offers those absolutely stunning vistas from all areas. At one end of the pool decking there is an outdoor sitting space comfortable furnished with two huge C-shaped sofas. Centrally is the tantalising infinity edge pool, and to the other end of the decking, a dining area for enjoying some al fresco meals. No suitable for guests with mobility restrictions and younger active children.